Credit: Image by Christopher Milne. When a solar cell absorbs a photon of light, it starts an electronic race against time. Two particles — a negatively charged electron and positively charged "hole" — generate electricity if they fully separate. However, when these particles become trapped within a solar material before they can fully separate, it can diminish the ability of the material to convert light into electricity. Scientists at the U.S. Department of Energy's (DOE) Argonne National Laboratory have published a new study that identifies the process by which holes get trapped in nanoparticles made of zinc oxide, a material of potential interest for solar applications because it absorbs ultraviolet light. "If you are making a solar cell, you want to avoid trapping holes; but if you're making a photocatalyst, you want to trap them." — X-ray scientist Christopher Milne of Switzerland's Paul Scherrer Institute. Using X-rays produced by Argonne's Advanced Photon Source (APS), the researchers were able to see the trapping of holes in specific regions of the nanoparticle. This represents a notable advance, as previous experiments were able to detect the migration and trapping of electrons but not holes. According to Stephen Southworth, an author of the study, some have considered zinc oxide as a possible alternative to titanium dioxide, the most commonly used photovoltaic material. Understanding the hole trapping behavior is necessary to evaluate the viability of the material in solar energy applications, he said. Although hole trapping impairs the performance of photovoltaic devices, it can improve the ability of zinc oxide to act as a photocatalyst, as positive charges stored in the traps within the material can go on to act as participants in chemical reactions. "If you are making a solar cell, you want to avoid trapping holes; but if you're making a photocatalyst, you want to trap them," said project lead Christopher Milne, an X-ray scientist at the Paul Scherrer Institute in Switzerland. "Regardless, understanding how these atoms get trapped — and for how long — is crucially important for making functional materials that convert light into usable energy." The researchers determined that the holes became trapped in "oxygen vacancies" — places within the crystal lattice where an oxygen atom is missing. Zinc oxide, Milne said, has a crystalline structure that allows it to have many of these vacancies. The trapping happens because the vacancies have a lower energy level than the surrounding environment, creating an energetic crevasse for passing holes. To make their measurements, the researchers combined two different X-ray techniques: X-ray absorption spectroscopy and resonant X-ray emission spectroscopy. "Combining these techniques is uniquely possible with the setup we have at the APS, giving us a view that shows us both the atomic geometry and the electronic structure of the material," said Argonne X-ray physicist Gilles Doumy, an author of the study, which used the 7ID-D beamline at the APS. "APS was one of the only places in the world we could have done this experiment. It was a very fruitful collaboration," said Milne. The APS is a DOE Office of Science User Facility. The researchers indicated that future studies of the system could benefit from having the ability to take extremely quick snapshots of the trapping behavior. Such an experiment could be conducted at X-ray free-electron laser facilities like SLAC's Linac Coherent Light Source, also a DOE Office of Science User Facility. "Essentially, we want to see the same process but have the ability to take images a thousand times faster," said Southworth. "The functionality of the material is always going to rely on how behavior at early times in the process influences the behavior at later and longer times," added Doumy. "We need both pictures for a comprehensive understanding." 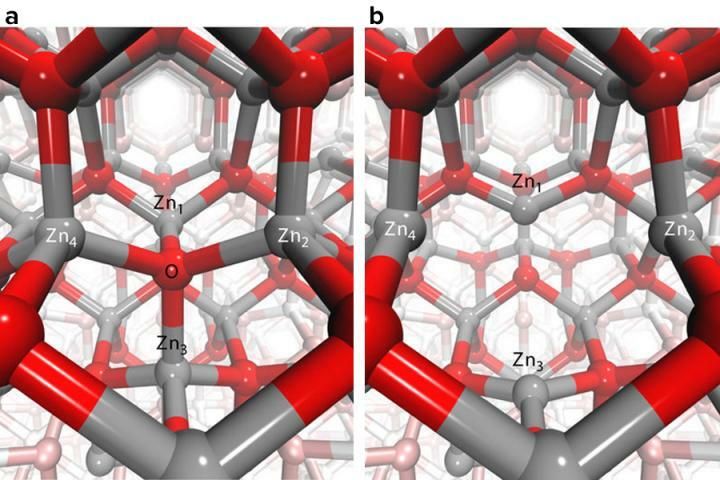 An article based on the research, "Revealing hole trapping in zinc oxide nanoparticles by time-resolved X-ray spectroscopy," appeared in the February 2 online issue of Nature Communications. Argonne physicist Anne Marie March also co-wrote the paper. The work was sponsored, in part, by the DOE's Office of Science.